Nancy Gideon... Romance By Any Other Name: IWSG: Why So Serious? Being a writer is a business. Stressful business. Exhausting business. Fickle business. Spirit- crushing business. Sometimes we struggle so hard scrambling to survive and to be taken seriously as professionals that we forget to enjoy what we do . . . even when it’s work. One of the most energy-draining tasks for a writer is the pressure to keep our name out there in the public eye . . . especially if we have limited funds or don’t have a publisher who will lavish us with free ads and promo. We pretty much have to count our pennies and our available hours and see how best to spend them. Neither ever goes far enough. This year, I had two launches for books that were e-only—a first for me. I had to find new avenues of promotion since the majority of the ones I’d used in the past were closed to e-books going solo without their paperback dates. The first book came out a week before Christmas, the second on Memorial Day. Seriously. Holiday time is NOT prime time to launch a book unless it’s a Holiday book. Readers are busy doing family things, not reading things. Social media becomes a ghost town. Publishers even forget to mention you because they’re with family not doing book things. So, how to call attention to the fact that I had new books out in a different venue . . .
Back in the day when promotion was all paper products, I looked outside the box to get noticed because I couldn’t afford those glossy, bare-chested markers that the bestselling authors were dumping everywhere like confetti at a ticker tape parade. Instead, I designed a bookmark that resembled a playing card for a new Dana Ransom historical romance, Love’s Glorious Gamble, with custom rounded edges, but very basic (read cheap) design. And it won a Romantic Times’ Innovation Award for promotion right alongside Brenda Joyce’s slick naked torso hero. Cool! And fun! When my “Midnight” vampire romance series came out, again no funds were available for top shelf promo, so I snuck under the wire with my “Sink Your Teeth In and Enjoy!” giveaway: labels generated on my home printer attached to cheap novelty plastic vampire teeth. I don’t think I’ve ever seen so many elongated canines at a writer’s conference. Again cool and eye-catching. And fun! When promo hit the digital age, the box I needed to think outside of became figurative instead of literal. Again, I couldn’t afford to take out ads to draw attention to my “By Moonlight” dark paranormal shapeshifter series, and was experiencing creative burn out from doing a massive amount of guest blogs and blog tours. 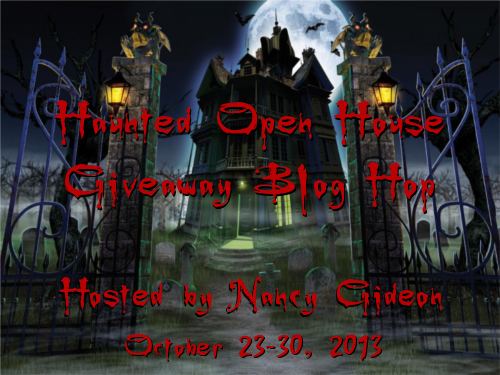 So I decided to try something different to bring blogger and reader attention to me with my 1st Annual Haunted Open House, using a fun format to exploit the paranormal genre I was writing in in a virtual way. My first HOH featured ‘rooms’ with fun posts, games, giveaways, industry guests, and a virtual library to spark interest in my titles. It was a surprising success. The next year it expanded to include VIP author guests and bigger giveaways along with a book trailer, cover reveal, and excerpts from my series . . . and attendance doubled. So did my sense of enjoyment and anticipation. This year’s 3rd Annual Haunted Open House’s doors open from October 23 to October 30. I built on to the original premise to go even larger with a Giveaway Blog Hop, and guests that would include my favorite PNR/UF bloggers/reviewers. And all I’m investing is the time it takes to write up tongue-in-cheeky posts such as “How to Host a Killer Party” and “How to Rock a Haunted House,” adding in playlists, gruesome recipes, deleted scenes and giveaways from my latest e-only books, sneak peeks of WIPs, and other amusing stats related to Halloween . . . with a lot of sweat equity from My Girl Friday/Rebel Yell Media, my virtual helper who translates my sometimes far out ideas into tech reality. And the best part, I have a blast doing it. I look forward to it every year. And so do my guests and visitors. It’s a payoff with the work being its own reward. Stop by for some Not Too Serious promotion, just for a smile or a laugh . . . or join in the fun! What outside the box things have you tried to break the seriously stressful self-promotion rules? Comment below then follow along the links to visit with others in our Insecure Writers Support Group. And don’t forget to make at least a dozen new friends . . . because it will make them smile! You always come up with the most interesting promo, Nancy. Lots of great ideas. Great read Nancy. 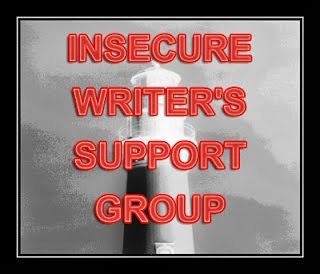 I also like the insecure writers support group title. Sounds like something I should be in with all my insecurities about my book about to be published and another one in a contest. It's a great way to get traffic to your blog and to harvest some fabulous ideas and inspiration. Great group. You'd be a welcomed addition. As Diane said, great promo ideas. You never disappoint, Nancy. You are awesome at promo, Nancy!! I'm a newly pubbed author and find promo very daunting. I did have fun doing a Facebook Release Day party for 2 of my books. It was very interactive and I did gain some sales and followers-not to mention, loads of fun! Otherwise, I'm stumped when it comes to promo. Love your ideas-thank you! Whatchu talkin' 'bout, Jen? You do great blogs that I've had the pleasure of visiting. You got it down, girl. I can't imagine launching a book during the holidays. Nothing appears to get done during the month of December around me. Especially not in publishing! Enjoyed meeting you via your post. I admire your creativity (and your writing) along with your energy. Wishing you continued success, Nancy. You have a bundle of cool ideas for promotion! Thanks for visiting my blog and it's nice to meet you! Dec 9 is plenty early. You'll be fine. Nice meeting you too! What ingenious ideas, Nancy! If I ever publish a book ("Someday..." she says, wistfully) I'm coming to you for promotion ideas! Looking forward to the HOH! Woohoo! I'm surprised we hadn't met. Thanks so much for dropping by, Nancy, so I could catch up with the fun around here. Thanks for the insights on the e-publishing front. It's helpful info. Good grief, my ghoul - er, girl! Your creativity never ceases to amaze! Your HOH will be a howling success. all of this promotion talk FREAKS me out for my own books. Way to own it! What a great promo idea, Nancy. I'm loving being part of IWSG and coming across such inspiring posts.